Come here to create your Character. Come here to create your box weapons after your character has been approved. Come here to create your Character's weaponry. Come here to create techniques suited to your Character. Come here to claim a Canon Character. Come here to create your Rings to use your Flames. Create your Mafia Family here. Check rules in the Character rules, Box Weapon rules and other rules. Come here to make NPC's for your missions. Come here to request missions for your Character. The Vongola headquarters in Italy. This is the Main branch of the Vongola where the Ninth and previous boss of Vongola reside. This is where the Main Base of Operations for the Vongola resides. 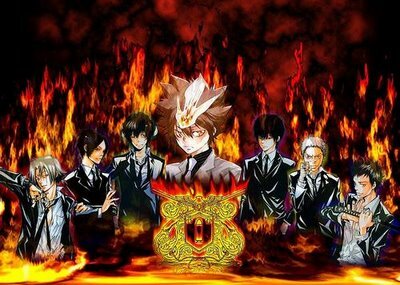 The Varia are the Vongola Family's elite, independent assassination team. They are composed of genius assassins who work in the deepest recesses of the Mafia. Each member takes on missions that are said to be impossible to accomplish by humans; however, they do not accept a mission unless they believe there is a 90% chance of success. Those that see them work often say that their high level assassination skills are demonic. The Chiavarone Famiglia is the number three Famiglia in the Mafia alliance together with the Vongola Famiglia. The Famiglia is one of the largest with over five thousand Members at its disposal. It is currently being led by the Tenth Generation Boss, Dino. Venice is a city in northern Italy known both for tourism and for industry, and is the capital of the region Veneto, with a population of about 272,000. Together with Padua, the city is included in the Padua-Venice Metropolitan Area. The city stretches across 117 small islands in the marshy Venetian Lagoon along the Adriatic Sea in northeast Italy. The saltwater lagoon stretches along the shoreline between the mouths of the Po (south) and the Piave (north) Rivers. Rome is the capital of Italy and the country's largest and most populated city and comune, with over 2.7 million residents in 1,285.3 km2. Rome's metropolitan area is the second largest in Italy (after Milan), with some 3.7 million residents. The city is located in the central-western portion of the Italian Peninsula, on the Tiber River within the Lazio region of Italy. One of Italy's most populated Cities. The main branch of the Kasai family. The Simon Famiglia is a Family which has had ties with the Vongola ever since Giotto founded Vongola. However, over time they've become an extremely small and weak Family, so much so that Reborn, who has an extensive knowledge of the Mafia world, didn't know about them. Tokyo, officially Tokyo Metropolis is one of the 47 prefectures of Japan. It is located on the eastern side of the main island Honshū and includes the Izu Islands and Ogasawara Islands. Tokyo Metropolis was formed in 1943 from the merger of the former Tokyo Prefecture and the city of Tokyo. Tokyo is the capital of Japan, the center of the Greater Tokyo Area, and the largest metropolitan area of Japan. It is the seat of the Japanese government and the Imperial Palace, and the home of the Japanese Imperial Family. This is an OOC spar where you can be killed and it doesn't affect you in character. But no god modding here either. You can spam here. Put pictures up; put character theme songs etc. List funny videos you have seen here.